Not your average “cheap” web host, Hub exceeded our expectations in many ways. Not only did testing indicate 100% uptime, page-load speeds were amongst the fastest recorded to date — rivaling our highest-ranked host, A2. While we did take issue with certain usability aspects and the company’s pricing disclosure policies, Hub’s Spark plan includes a number of best practices features. 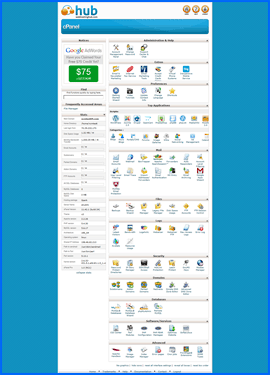 Amongst these are the user-friendly AMP (Account Management Panel), the cPanel control panel and the Softaculous applications installer. Overall, Hub produced a 4.5 star average. On balance, Hub has earned the NCM Online designation of RECOMMENDED. 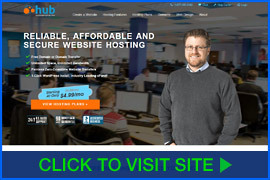 Hub (also known as Web Hosting Hub) offers three low-cost, shared hosting plans — Spark, Nitro, and Dynamo. Each provides an excellent number of unlimited features including: disk space, bandwidth, e-mail accounts, FTP accounts, sub-domains, parked domains, and MySQL databases. Free applications include a choice of shopping carts (Zen Cart, Cube Cart, OS Commerce), blog platforms (WordPress, b2evolution), content management systems (Joomla, Drupal, Moodle, concrete5), forums (phpBB, Simple Machines Forum), photo galleries (Gallery, Coppermine, 4image), Backup Wizard, Premium Website Builder, as well as the easy-to-use Softaculous applications installer. All three plans include a free domain name and are backed by 24/7 US phone, chat and e-mail support, an A+ BBB rating, and a generous 90-day money-back guarantee. According to Hub, a key difference between the three shared plans is in the allocation of resources and server performance. Additionally, the higher-priced Nitro and Dynamo plans provide the ability to host an unlimited number of websites, e-commerce capabilities, a choice of datacenters, and free website transfer. Pricing for the Spark plan is listed on the homepage at $4.99 per month (3-year term), while Nitro is listed at $6.99 per month (3-year term), and Dynamo is listed at $8.99 per month (3-year term). There are no asterisks following the prices, so one might reasonably assume that the plans renew at the same rates. This is not the case. No matter what term or discounted price is originally selected, plans renew annually at the following rates: Spark: $8.99 per month; Nitro: $12.99 per month; and Dynamo: $19.99 per month. While renewal pricing disclosure is a common issue throughout the web hosting industry, we find Hub’s particular policies problematic. Their Ease-of-Use and Satisfaction rankings have been penalized accordingly. 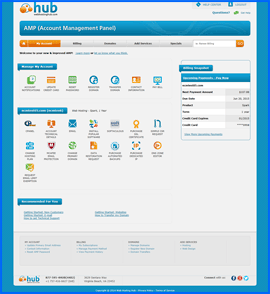 Hub AMP (Account Management Panel). Click to enlarge. As is our practice for purposes of testing and review, we selected the cheapest plan (Spark) and proceeded to checkout. Hub utilizes a simple, 2-step checkout process. Step 1 provides the option to register a free domain name or use an existing one. Account and billing information are entered in Step 2. We take issue with the fact that the “Automated Secure Backups” option is pre-selected and must be unchecked to remove the additional cost from the shopping cart. While we have seen other web hosts use the same tactic, it is not one we are particularly fond of. We find the automatic addition of “extras” to the shopping cart to be a less-than-consumer-friendly practice. NCM Online has and will continue to point out any less-than-transparent business practices employed by the web hosting companies we review. Further, we have and will continue to deduct from the ease-of-use and satisfaction ratings of any host that utilizes such practices. Hubs’s ratings have been adjusted accordingly. The remainder of the checkout process went smoothly. However, it should be noted that payment options include Visa, MasterCard, Discover, and American Express — but not PayPal. We would have liked the option to make our purchase via PayPal rather than provide credit card information to yet another online service provider. Hub cPanel control panel. Click to enlarge. Within minutes of clicking the “Purchase” button, the “Welcome” e-mail arrived in our inbox. While it included a link to the AMP (Account Management Panel — see screenshot above right), it did not provide FTP login information, DNS (nameserver) settings, or e-mail settings. While we certainly prefer not to dwell on negatives, having the web hosting account’s technical details at our fingertips in a single document that can be printed or easily filed for future reference is undoubtedly a time saver. We cannot begin to calculate the amount of time we have wasted hunting down these crucial details when using hosting services that fail to provide them in the “Welcome” e-mail. Once inside AMP, we were able to access the user-friendly cPanel control panel (see screenshot right) and upload our simple one-page test site using the integrated file manager. We then proceeded to the task of setting up speed and reliability testing. 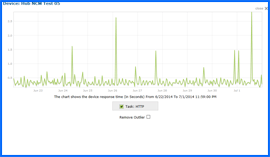 Dotcom Monitor testing began on 6/22/14 and concluded ten days later on 7/1/14. 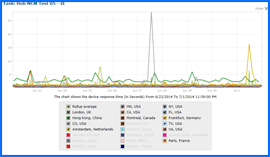 Our Hub hosted website was checked for page load speed and uptime every 15 minutes from 13 worldwide locations. In all, the testing consisted of nearly 2000 individual server checks. We could not have been more pleased with the results. Not only had the low-cost Hub Spark plan provided 100% uptime, it had also produced some of the fastest page load speeds recorded to date. Hub Uptime Test Results Chart. Click to enlarge. All web hosting services reviewed by NCM Online are purchased and subjected to our 10-day test for uptime and page-load speed. Over 10 days Hub produced a perfect 100% reliability score (see test results chart right) while providing blazing fast page-load speeds. Hub averaged only 1.1252 seconds to load our test page from the 13 worldwide locations (see test results chart below right), and an equally impressive 0.8728 seconds to load our test page from the 7 US locations. Hub Speed Test Results Chart. Click to enlarge. Hub excelled during testing and proved itself worthy of your consideration. If not for the certain less-than-consumer-friendly practices, they may have ranked as the best shared hosting service reviewed to date. Hub has earned 4.5 stars and is recommended by NCM Online. Cheap website hosting company price comparisons based on 1-year term list price before coupon/promo codes or limited time/introductory offer discounts. These are the renewal rates for the second year of hosting. To ensure that you receive the most affordable Hub pricing possible, please visit our Web Hosting Coupon Codes page for current discounts and special offers before making any purchases. Web Hosting Hub (Hub) offers quality hosting services, assists customers in getting their websites online, and provides them with customer support 24/7/365. As a result of the company’s commitment to be the best hosting provider, it has built a very loyal and growing client base. Hub was founded in 2001 and is headquartered in Virginia Beach, VA. Over the years the company’s goal has been to offer customized business solutions through user friendly and reasonably priced products, including web hosting, domain names, and complimentary web application. The firm has focused on achieving the best quality of service, technical assistance, and customer satisfaction in the industry. Hub’s 1-click installer, Softaculous, allows customers to get their websites up-and-running rapidly. This simple installer not only helps customers set up dozens of applications for their websites, it assists them in keeping the software up-to-date, so their websites can be more secure and perform at their best. Hub allows clients to move effortlessly from their current hosting companies. The transfer procedure involves no downtime so that customers can avoid the pain of “packing.” Customers receive some of the most popular tools on the web, including the website building tools WordPress, Drupal, Joomla, and Concrete5. Each web hosting package includes applications that make it simple for clients to include advertising, learning management and social networking applications to their sites. The firm provides specific tools for online retailers, including the eCommerce platforms Prestashop, OpenCart and Magento. Hub has one of the web hosting industry’s most extensive programs for those who are new to website creation. The program not only includes tutorials and information databases, but also community support in the form of members willing to reply to questions and share the latest information about what does and doesn’t work. For small to medium businesses that desire more sophisticated websites, Hub offers custom tailored design and maintenance packages. Hub also has created a variety of shopping cart solutions for customers who want to add eCommerce functions to their websites. Each cart combines unlimited robust products with user friendly reporting systems so that clients can quickly and easily create online stores. Hub’s experienced staff also can assist clients with social media and search engine optimization (SEO). They’re familiar with the newest SEO techniques to help clients’ websites achieve prominence in search engine results. They can aid customers in targeting their website promotion to desired geographic areas. Hub continues to help web-based businesses create buzz on social networks such as Linked In, Twitter, YouTube and Facebook. This video tutorial will show you exactly how to install WordPress on your Hub shared account using the cPanel control panel, and the Softaculous script installer.